ALABAMA Radio takeover on Sirius XM! Tune in to Sirius XM Prime Country, channel 58, next weekend starting on Friday, 8/30 at 6 PM ET to hear ALABAMA take over the airwaves! 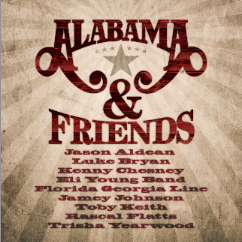 The ALABAMA takeover will feature two cuts per hour from the new album “Alabama and Friends” along with 6 Alabama hits per hour – all hosted by the band! Sign up for a free trial of SiriusXM!